You usually can tell when your dog has fleas as it will start scratching and biting itself. 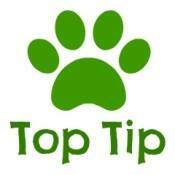 The way to check is to run a flea comb through it's coat or part the coat if your dog has a dense coat and check. If you see flecks that look like dirt empty them onto a piece of white kitchen roll or paper and squidge together with fingers, or add a drop of water and if the dirts turn a reddish brown colour then that is flea dirt. You then will need to treat your dog and if you have any cats those too,with a flea treatment and often the home too. It's ideal if you follow a regular flea control routine as a preventative whether you use commercially bought chemical treatments or prefer the natural approach. Sticking to routine helps keep them at bay, but sometimes even these measures do not always guarantee 100% total prevention and unfortunately you dog may still get them. Flea larvae can be infected with tapeworm eggs. So it is important that your dog is wormed regularly or you are aware so you can seek treatment . Below we have described some examples of common prescription and non-prescription treatment plus natural alternatives. The products listed are to demonstrate what is available but owners should in the first instance consult their vets, do their own research and follow the instruction sheets with each product. Not all products are listed, but a few to give owners an idea. Information taken from products websites and internet. There are various types of flea treatments you can use, these range from Spot on treatments, tablets, shampoos, collars,sprays and natural products which are usually added to dogs food. Flea treatment using tablets and spot ons ( liquid treatment in a tube that goes on back of neck) is usually based on the age and weight of your dog. Some are prescription only and can only be given by your vet or by acquiring a vet's prescription to purchase from other companies. Most vets will charge for this. This is a chemical treatment usually applied in-between the dogs shoulder blades/back of the neck. A common non- prescription spot-on is Frontline. This covers Fleas, ticks and biting lice. It is normally applied very 8 weeks.Though people are reporting this not to be as effective as it used to be. Frontline contains Fibronil and there are other products with this ingredient like Frontline such as Fibrospot and Eliminall and others available on the market. Prescription spot-on is Advocate this covers fleas, heartworm prevention, gastro-intestinal worms, control of ear mites and treatment and control of Demodex and Sarcoptic Mange. It is normally applied monthly. Bravecto chewable tablets : are used to kill adult fleas and are indicated for the treatment and prevention of flea infestations and the treatment and control of tick infestations. Comfortis Chewable Tablets for Cats and Dogs are flavoured chewable tablets for easy oral administration indicated for the prevention and treatment of flea infestations for up to one month. Should not be used on puppies less than 14 weeks old or dogs weighing less than 1.3kg. Effipro Spray is for the treatment of flea, tick and biting lice infestations in both dogs and cats. The spray can also be used as part of a treatment strategy for the control of Flea Allergy Dermatitis (FAD) and is effective against new infestations with adult fleas for up to 6 weeks in cats and up to 3 months in dogs. Is also effective for up to 4 weeks against ticks, depending on the environment. 'Billy No Mates' comes both in powder form and as a tincture and is a natural Flea, tick and mite repellent. Diatomaceous Earth ..used externally on the coat. Exner by Pet guard a spray that is non chemical based and there are others such a CSJ skinny. Shampoo : Neem based products and Penny Royal Shampoo by Dorwest herbs. If your dog has fleas then your home will have too. Therefore it is important to hoover everywhere and wash all pets bedding, your own and also towels, cushion covers and any other loose fabric covers. Treat cats if you have them too. You can buy sprays that are very effective in getting rid of household fleas and eggs such as : Acclaim and Indorex. 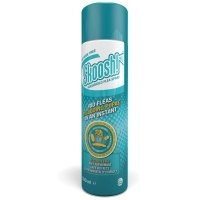 Skoosh Flea Spray is a pesticide free, silicone based spray that can be used safely in the home around children and pets. Recently reformulated to improve efficacy and coverage, Skoosh Flea Spray effectively acts as a "sticky trap" as it coats flea eggs, larvae, pupae and adults with its active silicone ingredient. Working instantly to treat every stage of the flea life-cycle, adults and larvae are immobilised in seconds, eggs and pupae are prevented from ever hatching and biting fleas are instantly stopped, offering immediate relief to distressed owners. Skoosh Flea Spray is the perfect choice for pet-owners wishing to control flea-infestations without having to use insecticides. Please be aware that Skoosh can be transferred from treated areas to untreated areas on the feet of pets and their owners, potentially making certain floor surfaces and footwear extremely slippery. They may remain slippery for some time and we encourage extra care to be taken after applying the product in your home. Please note: This product is not to be applied directly to your pet. 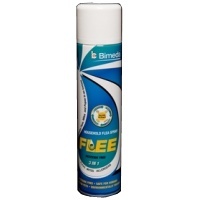 Bimeda Flee Pesticide Free Flea Spray 400ml is a unique, pesticide free and environmentally safe flea spray for your home. This fast action flea spray kills all adult fleas, eggs and larvae by immobilising them in 0.4% dimeticone, making them unable to move or hatch. This quickly puts a stop to any flea infestation in your home. This odourless non-insecticidal flea spray is scientifically proven to dramatically reduce dust mite allergens, helping both human and pet sufferers. By getting rid of dust mites, allergic reactions and symptoms will calm and reduce the need for drugs. This completely safe second generation silicone based flea spray is a revolutionary product that is much more friendly to use, without risk of exposure to children or pets. These can be bought online . Puppies are normally wormed whilst at their breeders every 2 weeks until they are 12 weeks old. Then the manufacturers suggest that a regime should be : wormed monthly until 6 months then wormed every 3 months after that. Again wormers can be purchase online or from your vet and these are based on your dog's age and weight. Wormers can come in different forms : tablets, liquid, granules . Not all brands cover the same spectrum of worms so check what they cover. Verm x liquid. This is added to food for 3 consecutive days of the month. You can also buy this in the form of treats. This is added onto food. It is like a powder and normally you can add around teaspoon for a cockapoo on their food twice a week or daily. N.B You must use the feed grade or human grade type. Can also be purchased online at places like ebay and Amazon. 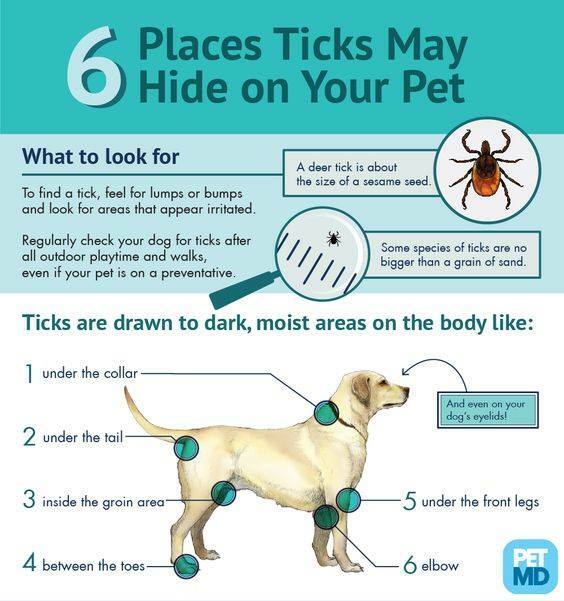 If your Cockapoo goes through woods and heathlands then they can be more prone to picking up ticks. 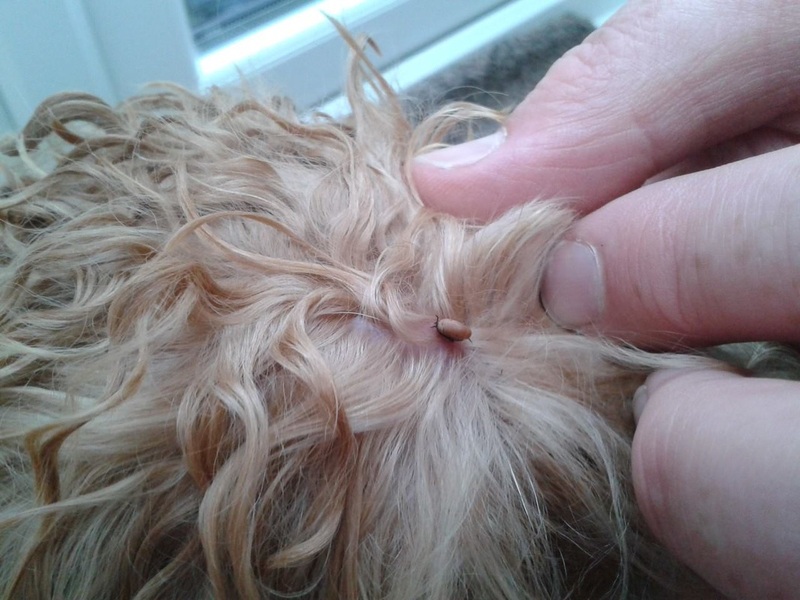 It is always good to check through your dog's coat, paws, lip folds and ears for ticks after walks and as part of your grooming regime.When grooming, brush against, as well as with, the hair-growth to see any ticks that are close to the skin. Like for fleas and worms there are products you can get such as spot on treatments, collars like Serresto or a chewable tablet like Bravecto. Or those who prefer a natural way Amber collars and essential oil sprays or Apple Cider Vinegar diluted in water and spray over coat before going on walks. ( though we cannot comment on effectiveness ). See this essential oil recipe for both humans and dogs from ThehomesteadSurvival.com. However do not let dogs ingest oils and Eucalyptus is not recommended for those with hypertension or epilepsy. Use a lint roller after walks, helps pick up any ticks that are not yet firmly attatched. You can buy them from most DIY stores, Wilkos and some supermarkets.